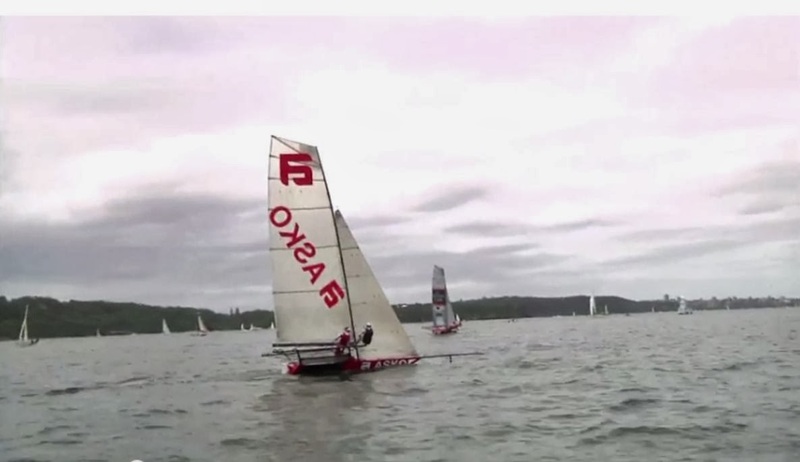 I subscribe to the online Sail-World newsletter and it had a video of a race from the 18ft Skiff Nationals sailed on Sydney Harbor on January 19, 2014. 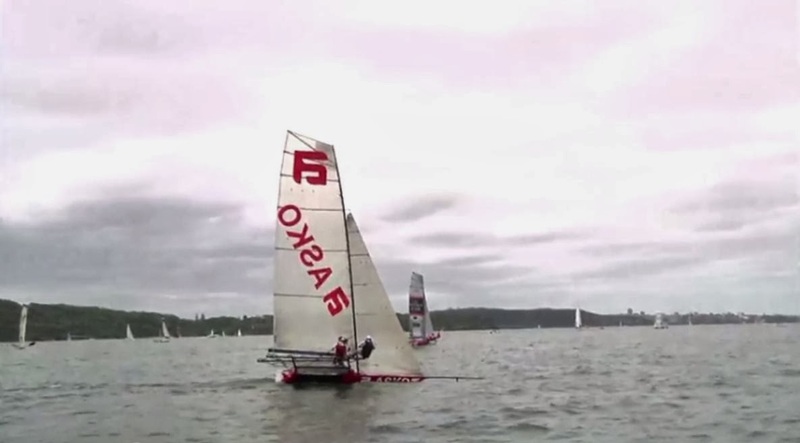 Most of the skiff videos focus on these flying machines screaming downwind and they're certainly fun to watch. 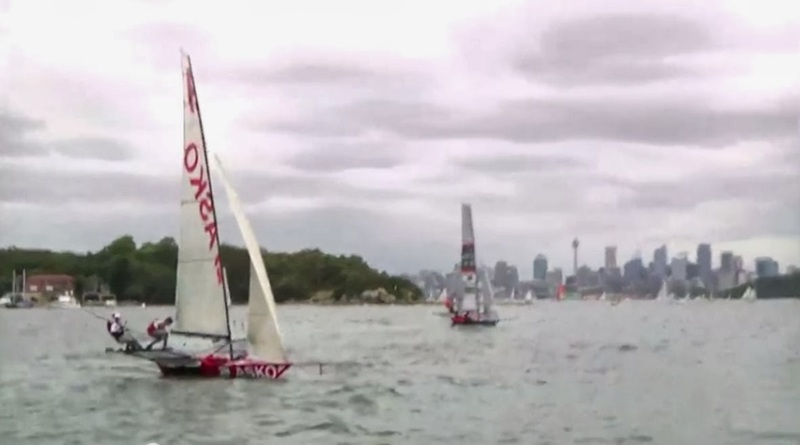 This race was in a more gentle breeze and I watched it because it brought back great memories of living in Sydney in my 20's. If you're a sailor, there is no place on earth like Sydney Harbor. 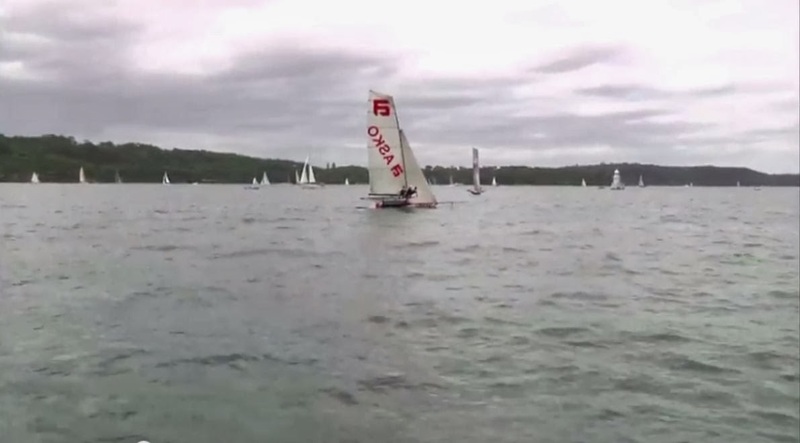 The windward mark was tucked away in Watson's Bay so the conditions were quite tricky. Here are the two leaders who we'll call red and grey. Red and grey are even. And then something happened that was a repeat of what I saw with the excellent coverage at the London Olympics. I wrote a post about how it was amazing to watch some of the world's best sailors make what to me looked like a really basic mistake: if the boat you're trying to beat gets an inside lift, not tacking immediately is a mistake. There were lots of comments - some agreeing but most disagreeing - including one from a Laser sailor who was actually competing (he disagreed). Pam even wrote another post that got even more comments that disagreed, none of which I found convincing. So the inside skiff red gets the inside lift we were all commenting on. Grey keeps going straight, red gets the inside lift. I wrote that I would have tacked immediately for a bunch of reasons that included a header on one tack (relative to the other boat) is a lift on the other tack, needing to stay in contact with the other boat, etc. But a lot of comments to my post said that grey should just keep going and things will even up, grey will 'foot to the next header,' tack, and regain any loss, etc. Grey either does not see this or decides to keep going. The changes in these angles don't last long and sure enough, grey gets the same lift within a minute. Now the wind direction is the same. In my opinion, it's way too late for grey to tack. So what happens? For me, the result is predictable. Grey hoping for a big header to catch red is rolling the dice with very poor odds. I did not see it in work at the Olympics and it certainly did not work here. 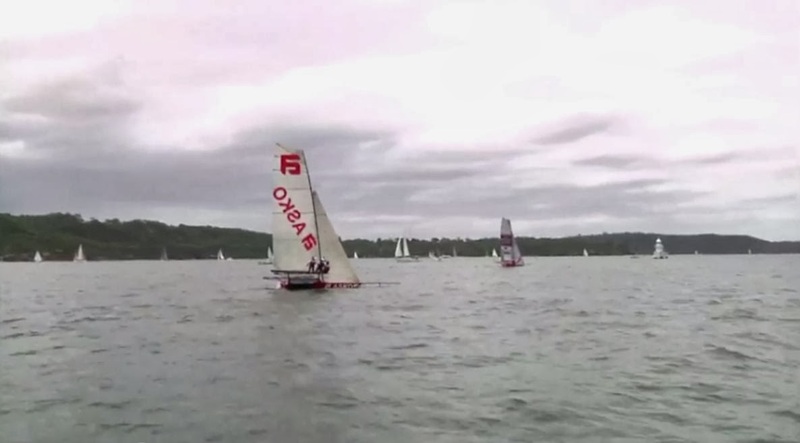 As they approach the windward mark, red has a solid lead over grey. Grey "puts it in the bank" by covering. In my opinion, someone on grey should have kept track of red, seen the inside lift, and immediately called for a tack. Grey would have been a lot closer or even in the lead. But grey did not, and tacking a minute too late cost it a minute at the first mark. No amount of boatspeed could have given red this lead so quickly. For me in these conditions, angles are better than boatspeed. Pam: Doug's recent detached retina and having oil still in his dominant eye has made his vision back to what it has been most of his life. As a result, I've noticed something interesting. Unlike the rest of us, he doesn't have the same variety of 3-D visual inputs. He operates in a stripped down 2-D world where he has developed strategies (rules of thumb) based upon very limited visual input. To him decisions are black and white and simple. To others, it might seems as if he's missing numerous nuances. I look at the above pictures and think about all the visual inputs that aren't captured that he isn't taking into consideration but whether it's live or a picture, his visual input is the same and his decisions are without doubt. I do have to wonder whether the 2-D simplicity has an advantage more often than not. It's rather hard to test that but his observations are certainly worth noting. Reverse the perspective for a minute. Imagine that red did not get a lift, but rather that gray got a header. In that situation, gray would immediately tack as you recommend. If both boats are inside the lay lines, the situation is identical -- just a different way of looking at it. So your recommendation to immediately tack makes sense unless you are certain of favorable pressure or shift ahead. Gray should tack. Exactly right, and well explained. This is sailing the competition vs. sailing the course. The key is "if the boat you're trying to beat..." which is easy in this case because both boats had punched out. The two examples from the Olympics I used were Tom Slingsby match racing in the last race and the women match racing in their keel boats. Who they each had to beat was well-defined. If you're 100% sure there's pressure ahead then you can foot to it, but it's still risky. This gets more and more risky towards the top of the course because the laylines limit how far you can go to get to that pressure. I tend to agree with you Doug, although if the breeze was very shifty with short-lived shifts, I may not. A couple of weeks ago I was on a RIB that acted as the pin end mark in the 2014 Contender Worlds at Belmont 16 Foot Skiff Club in NSW. I was also on a rescue RIB for a Paper Tiger Interdominion on Port Phillip Bay in Melbourne. 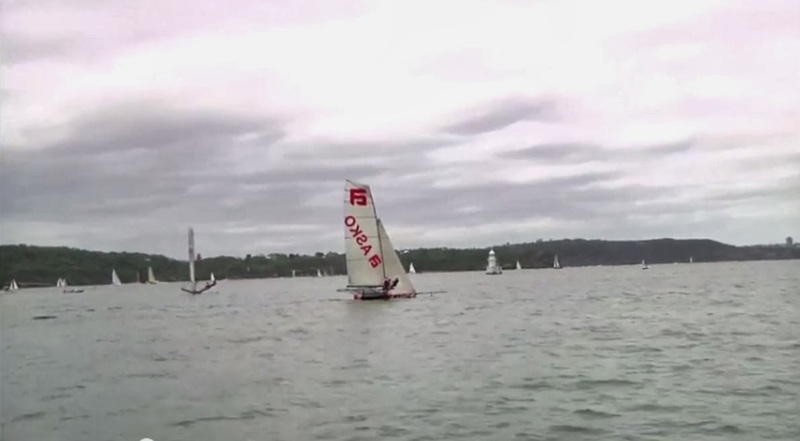 One thing that struck me in both of these regattas was that in cats and trapeze boats, a tack isn't fast as in a Laser so I saw sailors continuing to sail on in quite big headers. I also see this occurring in the skiff classes at Belmont. There is a reluctance to tack on shifts in these classes and they are inclined to "bang the corners". 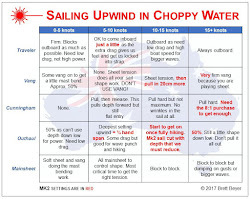 In very shifty breezes, two tacks in boats that are experiencing upwind planing conditions can actually be slower than any gains they may make. I haven't yet seen the video as the links would not work for me, but it looks like plaining conditions were marginal, so I think Red should definitely have tacked and then tacked again on the inevitable port tack header. However, as your picture series clearly shows, grey lost a LOT of distance relative to Red, so in hindsight it was a big mistake. I certainly would be drilling my crew in the art of making quick tacks in this situation. Well put! An AC72 has to think long and hard before tacking - going from 50 to 5 to 50 again is really expensive. In Lasers, it's a no-brainer. The slower the tack, the harder the decision. 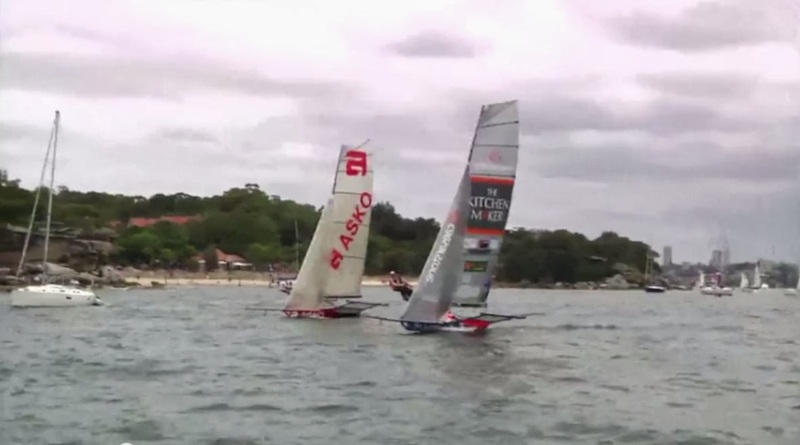 The skiffs in the video tacked quickly so Laser tactics would have worked. I remember watching a cat nationals in Albury around 1975 and was amazed how little they tacked. Picking the correct side was important and the winner was rarely the first to tack when there was a wind shift. Very interesting thoughts thanks. By not tacking Grey needs the wind to advantage him by the same margin at some time. By tacking towards wind that is known to be better (Because he can see Red), he will get the same wind advantage but at the cost of an extra 2 tacks. I think it is not possible to apply this tack rule, without knowing the characteristics of the wind. Eg a chaotic/fast shift day will even out, so not tacking is more favoured. and vice versa. I think the tack/no tack decision in planing boats or catamarans is much more complex than displacement boats because they are sensitive to windspeed as well as direction, yet have a higher tack loss. I've often observed Laser fleets tack simultaneously. Either they all got the shift at the same moment or a flock mentality is being shown. If tacks are ~free then there is no immediate consequence to doing what everyone else is doing. Off topic: how many metres or boatlengths does a Laser lose in a tack? AC72s lose 1 1/2 boatlength tacking, the v5 monohulls used in Valencia lost about 3/4 bls - which is about 4 seconds loss for both. Modern dinghy cats tack much better than a '75, but still lose about 4 bls. Thanks for your thoughts. 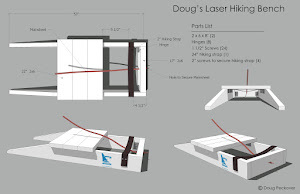 In most conditions, a Laser will not lose and will sometimes gain from tacking. From a tactical perspective, this is great because we can try tacking and if it does not look like it's going to work, tack back again without any loss. These skiffs slow down for sure but not enough to ignore the tacking options IMHO. I should add that my style is staying close to the boat(s) I'm trying to beat. Pam would say that it's a vision thing but it's also because there are a bunch of people who are better at understanding the conditions that I am, so I like to tag along and rely on boatspeed. Using numbers it's clear for me that with more separation , the gain would be higher , so the key is not allow that separation... Great blog , and very interesting articles ! Thanks. When I'm in red's position watching grey, I say to myself "please don't tack, please don't tack" because I'm gaining about one boat length every 5 seconds. For grey, the separation is a killer and why it should always minimize it unless there's a lot of pressure just ahead. What if a boat gets an "outside" lift on you? Would you tack? What if grey started pointing higher than red? Should red tack away or sail toward grey? It seems like this wouldn't be as easy a decision as the inside lift situation. For me, everything is reversed if grey is lifted and red is not. Red should tack to immediately be on a lift. As a bonus, if grey follows it would now be the one on a knock. If I'm grey and lifted, I say to myself "please don't tack, please don't tack" because I'm gaining about one boat length every 5 seconds. I tried to show these angle diagrams in the original post that is linked above. The reason I ask this is: if a boat inside of you is pointing higher, it is because some combination of a) it has a localized lift; b) it is in more wind; or c) it is in less adverse current. Tacking would be a no-brainer because if the reason the inside boat is pointing higher is b or c, tacking would take you toward that advantage and you would also improve your angle. If a boat outside of you is pointing higher, it is also because a) better angle; b) more wind; or c) better current and if the reason the outside boat is pointing higher is b or c, while tacking would improve your angle, it would also take you away from better wind or current. Actually, if a boat either inside or outside of you is pointing higher because of b or c, tacking wouldn't improve your angle. But if you have no idea why your competition (inside or outside) is pointing higher, it seems like a better bet to tack if a boat inside is pointing higher. My little brain does not worry about lift vs. wind vs. current. I need things to be simple. Rule #1: if the inside boat is pointing higher, that's where I want to be and I'll tack if I'm not there. Rule #2: if the outside boat is pointing higher and it's me, great. If I'm inside then I'm on a knock. Tacking will not get me to there I want to be but will immediately stop the bleeding. For me, keeping it simple is important because there are so many other factors to consider, like preparing for how the conditions will change again, what's the rest of the fleet doing, how's my speed, etc. Sorry to keep commenting, but I find this topic really interesting, and not widely written about. Would it be fair to say that this strategy works better in boats whose pointing angles are less affected by wind speed? In these types of boats, sailing angle would be more an indication of wind direction rather than wind speed - genuine lifts and headers, as opposed to velocity lifts and headers. In these types of boats (i.e. keel boats) the situation is simpler. Your comments are always welcome. Pam has taught me a lot by asking questions and then having me simplify the answers. In fact, the whole idea of managing angles came from one of her questions. I have no first-hand experience on boats where pointing is affected by wind speed (someone like Julian Bethwaite would know much, much more). But it's fair to say that these changes would really mess up my simple rules of thumb that work so well on a Laser. If there's less wind on the left then there's yet another reason for grey to tack and stay closer to red. It matters not if it's an Ice Boat or a 49er or an 18teen they all live and die according to apparent wind angle and lifts and knocks are still very important, in fact, I dare say, more important. Ok, I remember well, when I started my 18teen career back in the dark ages, late 70's, we often would converge on Bradley's Head with a bunch of Etchells or Solings and it always surprised me about how high they pointed compared to an 18teen. Sometime later my father explained that in fact their apparent wind angle was quite poor, but because they were only doing 5-6 knts and we were doing 12-13 knts they could easily out point us compared to the real wind. 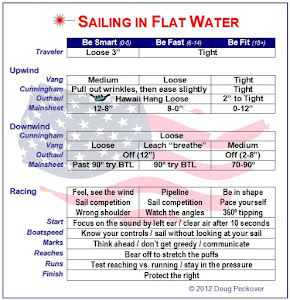 The reason I bring up this point is that sailing a skiff has 1 extra dimension to it, which is control of your speed. So where as a Laser sailor or a E22 sailor is always trying to hit a target speed and then once there they look about for opportunities (lifts, knocks, gust, lulls, etc.) the skiff sailor does all that, but in his quiver of opportunity he also has the opportunity to get to another place on the harbor quickly should something interesting be happening over there or should there be a reason like a long lasting shift he can slow the boat down and point the eye out of the needle, way above any Soling and hold a lift or a lane or a groove for so much longer with considerable advantage. And all that being said, if it's relatively stable (which it never is) then being on the right side of a shift, given you're doing 12-13 knts through the water and have a tacking angle between 90-95d, then a 5d shift is all the more important. Or to put it more succinctly, being on the wrong side simply means you're going down the tube twice as fast as the next guy. Errors hurt. That is possibly what you saw. You see the slowing down to gain height so often when they are coming into Shark Island and have it a bit wrong, too low on the course, so drag a wing, slow the boat down and you can come up 15-20d quite easily! It's slow but it beats dropping the kite. If the outside boat (ie. Gray) gets a lift and Red tacks, isn't Red tacking away from the breeze that is providing that lift and therefore Red has a reduced chance of getting the same lift and Grey will further improve its position? I'm just trying to understand the reasons that Red should tack. If approaching a lee shore where the wind is bending and providing Grey's lift, does that change anything? I'm thinking of something like the RHS of the Nothe course at the 2012 Olympics where boats were getting a lift close to the shore. In that situation should Red continue, hoping to get the same lift that Grey (outside boat) does? Red does reduce it's chances but going straight costs dearly for only the chance of getting to the same breeze. If there's clearly more pressure, then red keeps going accepting the fact that it's losing to grey. Otherwise, red tacking preserves its position relative to grey. If red then gets the same breeze then it's a knock, it tacks back onto the starboard lift, and it's probably OK.
Local conditions like the Olympics should not change anything about when to tack, but the sailors should have a better idea of what to expect. But there's the other consideration about wind velocity which could be greater or less closer to shore. More velocity can make a bad angle look really good. Here is a question then: If you as the outside boat are always willing to tack (often off a lifted tack), then where are your upwind tactical gains around the course? That is, minimising losses are one thing but where are your genuine gains you can make? For me, sailing the angles is relative to the competition, not the course or wind. So if I'm on a lifted tack but the boat(s) I'm trying to beat are being lifted more, then I'm on a knock relative to them. Having said that, there has to be a really good reason to tack when you're on a lift. In terms of tactics, I try to use upwind angles to stay with the leaders, so it's really a case of minimizing losses at the front of a good fleet. But mistakes are made by even the best sailors, so angles are a rare way to gain on them. Boat speed alone will not do this.